Wanted: Husband for godly, gorgeous virgin daughter. This wildly inappropriate ad was published by a father in the March-issue of a Christian magazine – and his daughter had no idea. You: unworthy, though becoming less so daily. 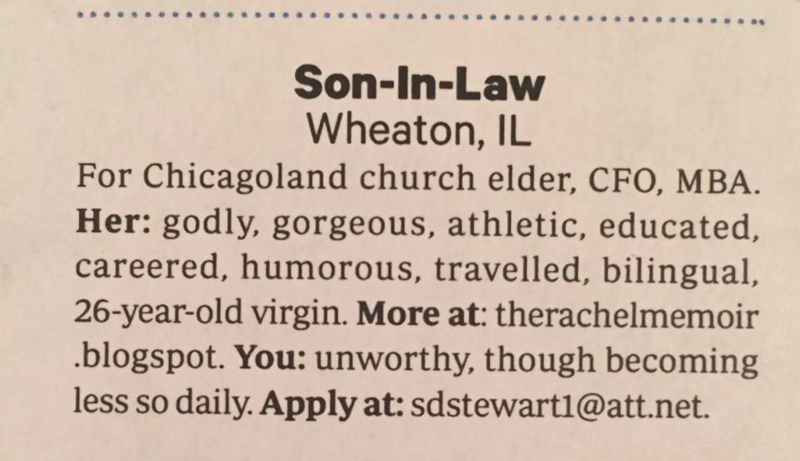 If that’s not creepy enough, this was advertised in the jobs section, with ‘son-in-law’ as the available position. According to The Daily Beast, the woman in question – Rachel Stewart – had no idea her dad posted the ad until strangers who had read it started leaving comments about it on her blog. Kind of unbelievably, Rachel wasn’t upset over the advert or her father’s other attempts to – as one commenter to her blog put it – ‘sell her like cattle’. She said she was more impressed than surprised when found out, and laughed about it. I’m just nervous if this doesn’t work out, next I’ll find my face plastered on a billboard. Oh gosh, now I’m giving him ideas. Well, even though she’s okay with it, the Christian magazine that published the advertisement is certainly not. Editor-in-Chief Mark Galli tweeted an apology on Friday, saying the ad was ‘rightfully seen as demeaning’ and was ‘in poor taste’. We have taken a hard look at our ad review process, made some changes, and we can assure our readers that no ad like this will appear again.